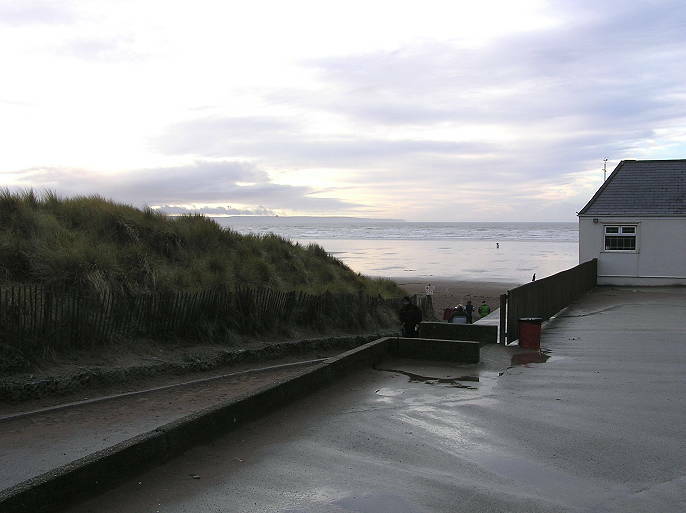 Saunton sands are a fantastic, three mile long stretch of West-facing golden beach. Unfortunately, at low tide, it's almost 3 miles to the water, too!! This is a very popular surfers beach, and you can make yourself very unpopular with them if you get in their way. Generally, the surfers stay up the top end of the beach which isn't brilliant for windsurfers anyway as the wind lifts over the cliff. 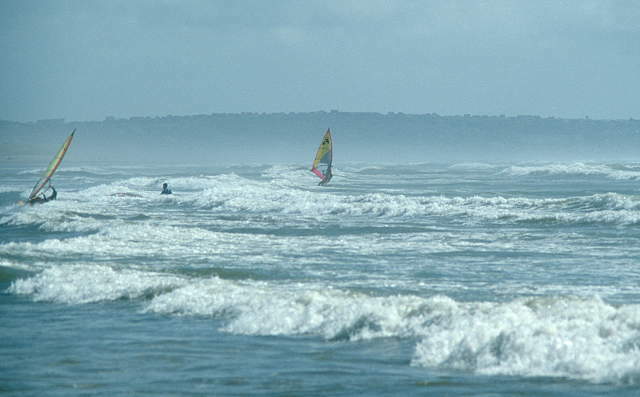 This is an out-and-out wave beach, with the waves being well spaced apart. It is also often called whitewater city: If there's too much W in the wind, the waves just turn to mush and break a long way out. Access to the beach from the car park is via a narrow, brick-walled path. As the wind tends to howl through here, it can be interesting trying to carry an assembled rig down the path (I got pinned to wall for a couple of minutes by my 5.0m one time!). Probably better to rig up on the beach. There's a small building at the top of the beach which can provide some wind shelter for rigging. For such a flat beach, I've found that there's a significant back-wash which can make it really difficult to get going off the beach when the wind's onshore. If it's too serious at Saunton, & the tide's in or coming in, head down to Crow Point where you can sail in the Taw estuary. From Bristol, take the M5 S. Leave at jn 27, taking the A361 to Barnstaple. Continue through Barnstaple on the A361 until Braunton. At the lights, turn L on the B3231 to Croyde. 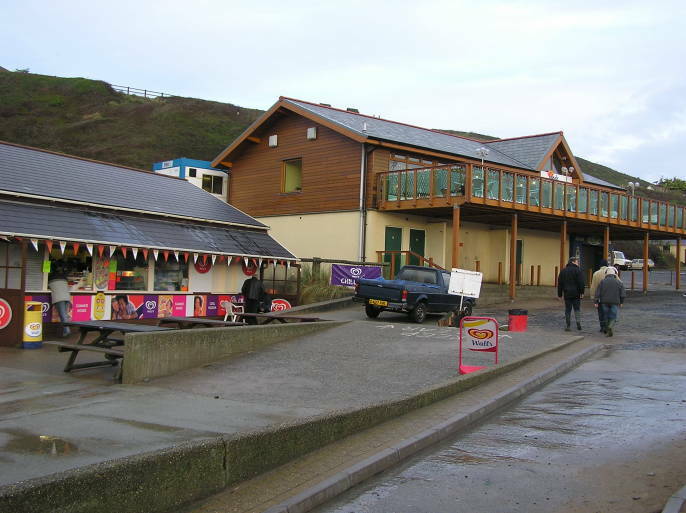 After about 2 1/2 miles, you come into Saunton (though you wouldn't know it). Go past the road on the L to the golf course, and take the next L down to the beach. You'll almost certainly have to pay in the summer. Get there early in good weather, as the large car park can fill up. NW - The best, usually stronger than forecast. N. If you head down the beach, away from the cliff, it can be very good. But sometime, you're going to have to get upwind again! Best to go to Westward Ho! NE - Go to Putsborough . SE - Good at low tide. HW springs tend to occur between about 07:30 and 08:30. HW neaps between 11:30 - 14:30 (GMT). Large tidal range - max is around 8.5m. That's why the sea goes so far out! 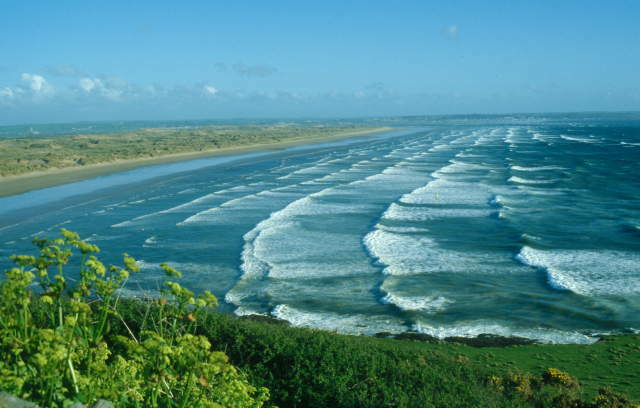 Saunton is quite a serious stroll down to the water at low tide, but that's when the best wave conditions are. Cliffs at the N end of the beach. There's no wind when you get close to them. The wind tends to funnel & howl along the path leading from the car park to the beach. This can make carrying assembled rigs "interesting". Large car park - it costs in the summer. Windsuring/kitesurfing shop in Braunton - Atlantic Action. Loads of surf shops there, too. 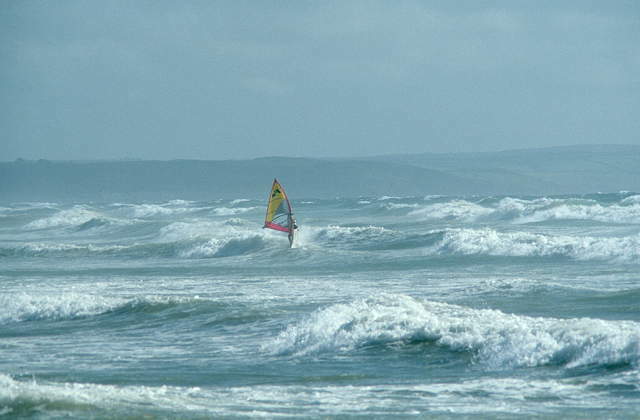 If the wind doesn't blow, drive round to Croyde & rent a surfboard or bodyboard. If there's no wind & you have a mountain bike, you can cycle along the Taw estuary right into Barnstaple. In fact, this is pretty good, easy bike territory. 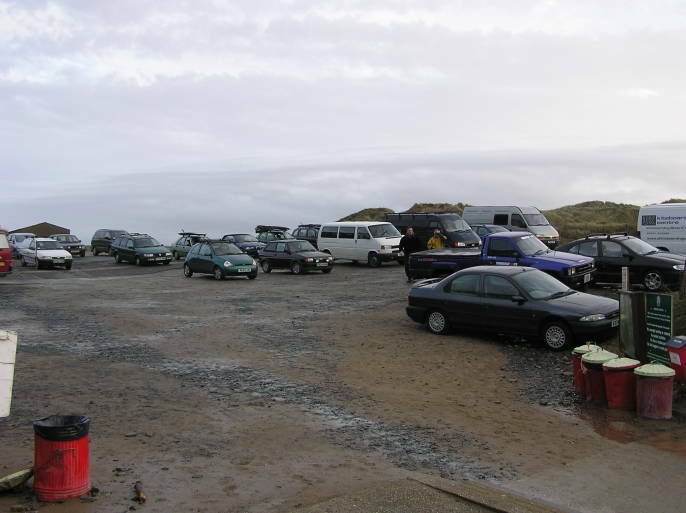 There are several campsites in the area - especially around Croyde. There's the famous Thatched Barn in Croyde - very popular with surfers. Good meals, but pricey. For my money, you can't beat the Rock Inn, Rock Hill, Georgeham - a mile or so East of Croyde. Great food, excellent range of well-kept real ales & good prices. Chippy, snack bars & other bijou eaterettes in Croyde. More pubs, shops, cafe's etc in Braunton.